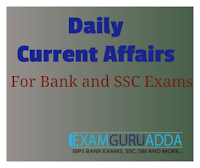 Dear Readers, we are presenting Daily Current Affairs for All Exams- 18th December 2016. 1. The Union Government has appointed Lt. Gen. Bipin Rawat as new Chief of Army Staff (CoAS). He succeeds Army Chief General Dalbir Singh who retires on December 31, 2016. 2. His appointment goes against the long-held tradition of appointing the senior-most eligible officer to the topmost post. With this criterion, he has superseded two seniormost commanders Eastern Army Commander Lt Gen Praveen Bakshi and Southern Army Commander Lt Gen PM Hariz. 1. The Union government has appointed senior IPS officer Rajiv Jain as the new chief of Intelligence Bureau (IB). He succeeds Dineshwar Sharma and shall have two years term. He is IPS officer of the 1980-batch of Jharkhand-cadre. 2. He had joined the IB in 1989 as assistant director. Since then he has worked in different capacities including the sensitive Kashmir desk. He had handled various assignments as chief of Subsidiary Intelligence Bureau (SIB), name given to IB units in state capitals. 1. The Union Government has appointed Air Marshal Birender Singh Dhanoa as the next Chief of the Air Staff of the Indian Air Force (IAF). 2. He succeeds Arup Raha who retires on December 31, 2016. Prior to this appointment he was Vice-Chief of IAF. He is the third person from Sikh community to head the IAF after Arjan Singh and Dilbag Singh. 1. The NASA has successfully launched constellation of eight mini-satellites as part Cyclone Global Navigation Satellite System (CYGNSS) into space to improve hurricane forecasting. 2. These satellites were air launched by aerospace company Orbital ATK onboard of Pegasus rocket fired from plane at height of 12km. NASA had opted for air launch rather than traditional rocket liftoff from the ground, to cut costs. 1. The Supreme Court in a landmark verdict held that Jammu and Kashmir is an integral part of India and did not enjoy sovereign status, either under its constitution or that of India. 2. The apex court made this observation while hearing on appeal filed by State Bank of India (SBI) and other banks over the issue of recovery of loans under Securitisation and Reconstruction of Financial Assets and Enforcement of Security Interest (SARFAESI) Act, 2002. It affirmed that J&K’s constitution was subordinate to the Indian Constitution and its permanent residents were Indian citizens. 1. India and Tajikistan have signed four agreements in areas including on double taxation avoidance, money laundering and counter-terrorism. 2. These agreements were signed following delegation level talks between Prime Minister Narendra Modi and visiting President of Tajikistan Emomali Rahmon in New Delhi. 1. The Union Government has appointed senior IPS officer Anil Dhasmana as new chief of Research and Analysis Wing (RAW), India’s external intelligence agency. 2. He succeeds Rajinder Khanna who completes his two year tenure on 31 December 2016. He will have tenure of 2 years.